Residents of Chatham-Kent who are concerned about reports that as many as 12 water wells may have been affected by pile driving activity during construction of the North Kent II wind power project continue their demonstration at the site today. The power developer filed for an injunction against them last week, citing concern for the safety of construction workers. The demonstration has been peaceful, and was conducted through the Labour Day holiday weekend. The campaign has been organized by local community group Water Wells First, which filed an appeal against the power project. The appeal was withdrawn when the appellants were not allowed time to have experts review a hydrology report submitted by the developer. Chatham-Kent has asked the Ontario government to halt construction until the situation has been reviewed, and property owners affected have been offered free water testing by independent laboratories. The Ministry of the Environment and Climate Change has taken no action. For more frequent updates on the demonstration, please check on our Facebook page, and/or at Water Wells First. Its their right and duty as citizens of Ontario to stop the contamination of any and all water!!!! The Clean Water Act (S.O. 2006, Chapter 22) is a law enacted by the Legislative Assembly of Ontario, Canada. The purpose of this Act is to protect existing and future sources of drinking water. Require local communities to look at the existing and potential threats to their water and set out and implement the actions necessary to reduce or eliminate significant threats.Empower communities to take action to prevent threats from becoming significant.Require public participation on every local source protection plan. This means everyone in the community gets a chance to contribute to the planning process.Require that all plans and actions are based on sound science. This legislation sets out a basic framework for the establishment of community-based groups that represent a cross section of sectors and geographic areas withinConservation Authority (Canada)boundaries. These community-based groups are called Source Protection Committees and there are 19 such groups across Ontario. The Clean Water Act, 2006also introduced the Ontario Drinking Water Stewardship Program (ODWSP) a financial assistance program for farmers, landowners and small or medium businesses for activities that reduce threats to municipal drinking water sources. It’s possible to compare renewable energy companies ownership with UNEP -FI North American members ? PEGI also traded on the TSX. Ristigouche Sud-Est in Gaspé region sued for passing bylaw protecting water sources from drilling. Just like Wind, we should have an open and honest debate about disposal of Nuclear waste. Now, back to wind turbines, are we going to allow them to do all the pile driving between now and Sept 28th? Once we get to court the damage is already going to be done. No justice. Our government has shown they will not intervene. Policy has been decided. Wind turbines will continue until citizens force them to stop. What is the location of the protest sites in Chatham Kent next Monday and Tuesday …. next week??? Notinduttondunwich writes “What is the location of the protest sites “. There was only one protest site, and they took that down on Friday 4pm. There are no other protest sites planned. The agreement was no protest/ blockade between now and Sept 28. I got this information from Jackie Girard who speaks for WWF (Water Wells First). Too bad the Water Wells First people are not anti-wind, or I would love to join their protest. They need to consider all the negative impacts of wind besides water issues. Renewable energy such as wind and solar are part of the U.N. global green economy agenda. This information is found in U.N. publications under sustainability and/or climate change. Home page at: unepinquiry.org has links to publications. Also links to U.N. publications. ‘Current Trends and Future Opportunities in North America’, August 2007, 82 pages. P.49:, Bibliography includes Canadian references. We at Water Wells First are well aware of all the negative impacts of wind turbines but choose to stick to the most serious issue that is facing us here. Frankly, you could argue the negative impacts until we’re all dead and buried and still not address them all. We felt it more prudent to stick to one issue as our local and Provincial politicians have the attention spans of gnats and if you attempt to overload their brains they simply close their ears, roll their eyes and tune you out. It is possible to have renewable energy projects that don’t do the harm that these are but when they allow foreign companies to do whatever they want, this is the outcome. Jackie, thanks for the clarification. When we speak to the MOECC agents/officers about low frequency noise and infrasound harm, we get the same response. “The MOECC only deals with audible noise.” and obviously they don’t do that effectively. They’ve consistently bungled their role in protecting people from the noise…even after finally capturing it on their faulty inadequate equipment! Minister Glen Murray suddenly quit when things came to a real head in early June on the noise issue. It turns out that the Ministry of Health ‘turns a blind eye’ to people begging for enforcement of the Radiation Emitting Devices Act. After much pressure on Minister Jane Philpott, she has been suddenly replaced by someone with no back ground on this serious issue. I sincerely pity the new Minister of Health. These government agents all need to be told that they will be held liable. We desperately need the energy portfolio to be managed by experts in the various relevant fields. These experts need to be guided by ‘number crunchers’ like Parker Gallant, who can see ahead and who care about the debt being left to our children and grandchildren and the fact that rising energy costs increase the stress on people who are on fixed incomes or who live in poverty . Most important of all, there needs to be members of that team who fully understand climate science and who realize the deceptions behind the rush to industrial scale renewables in Ontario. This needs to be an election issue…no more incompetency! 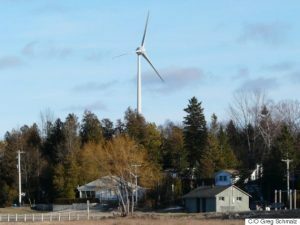 It is absolutely disgusting that not one politician at the opening day of the Ploughing Match has addressed the industrial wind turbine, according to the article in the Globe and Mail. Correct me if I’m ill informed.